Picnic Table Companion Products Compliments - Picnic Table Store-Commercial grade quality-lowest price. "Things intended to compliment one another". And so we compliment all picnic tables with wonderful products that work together to make the picnic dining experience enjoyable and functional. Our umbrellas are a necessary compliment with todays intense shade needs. Trash receptacles keep dining areas free of undesireable debree and ready for the next picnic. Grills....well grilling is a national pastime and one wonderful way to break bread with friends and family. We have a variety of market and garden style umbrellas in many shapes and sizes to accommodate your needs. We have square, octagonal, and hexagonal umbrellas in 7, 9, and 11 foot sizes. All of the umbrellas make great companion products to our picnic tables. 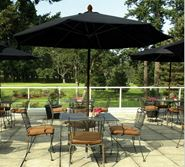 Our market umbrellas are made with heavy duty Sunbrella marine grade, solution dyed acrylic fabric that can withstand sun exposure. 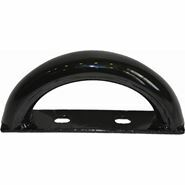 We also offer umbrella bases to go underneath a picnic table or freestanding to add support to your umbrella. We have a variety of different trash receptacles to match your picnic table. We have thermoplastic, wood, and concrete trash receptacles available. Having trash receptacles for your project is a necessity, which is why we offer a great selection. Keep your park, school, or HOA community clean! We have a selection of wood or charcoal grills. A barbecue grill makes an excellent companion product for a picnic table! Give your customers or guests a leisurely environment for barbecue grilling and socializing with a nice place to eat. 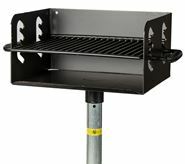 We offer a variety of commercial bbq grills for group gatherings. The DYI craze has taken hold of almost any project you can think of as people learn new skills, save money, and enjoy the creativity of doing their own thing. So why not build a picnic table. Just google picnic table plans or kits and you might find yourself here at Picnic Table Supplier. We have a many just frame options to give you choices in the size and construction picnic table plan that makes you happy. At Picnic Table Supplier we are here to help you meet all of your needs for your project. We offer a variety of companion products to give you a selection of a variety of styles and colors to match your school or business. Call our knowledgeable staff about what products you may need for your new installation, and we will help you get the best prices to stay within your budget.